By utilizing ODP.NET, Oracle database, and really very little effort you also can store images as a Blob for convenient storage and simple categorization. Execute an insert SQL statement against an Oracle database. Saving image data to the database. Writing image data to a file from the database. You should be familiar with an IDE such as Visual Studio .NET or equivalent. While such an IDE is not required it does make development efforts much easier. Also you should possess an understanding of ODP.NET and databases. In this case since we are using ODP.NET all further references to the database will be implied as an Oracle database. Now that I have discussed to objective and prerequisites we will now move on to establishing the database schema related to this article. There are a total of eight controls which I am using in this example of which three are RequiredFieldValidators and one is a Label. I will not discuss these controls rather you may take time to read the following. The one unique step you need to take for the HtmlInputFile Control is to import the System.Web.UI.HtmlControls Namespace. As well you will need to add the runat="server" attribute to this control. Once you have created your web form you should have something similar to the one above. If you view the source of this form you should have something similiar to this. <asp:TextBox id="DescriptionTextBox" runat="server" MaxLength="5000" Rows="10"
ErrorMessage="You must select an image to upload"
Now that you have you web form ready let us know take a look in the code behind. There are two things that I must bring you attention to before you take a look at the source code. 2. I have also wrote a utilities class to handle common functionality. This utility class will be discussed further in the article. /// Summary description for Article570. Now I will discuss the utility class that I previously spoke of. While this is not necessary I find it useful to separate my common functionality into it's own project. For this example I am using this utility class for my database handling. You could easily integrated thing such as sending emails, logging errors, and string functions to name a few. In this class I have two methods and a constant string that I have defined for the database connection string. Once again I am taking advantage of the ability to define values in a single local and in the case where I define the database connection string this value is stored in the Web.config file, of which below is an example. Now to reference this connection string in you class simply use the System.Configuration namespace. Be sure to import your ODP.NET Oracle namespaces as well. /// Summary description for OracleDatabaseHelper. Now when you are ready to instantiate this class an example would be as so. In the code behind the web form you will notice when I have my database connection wrapped in a try/catch/finally statement. I will not go into the details of this rather if you are not familiar with try-catch-finally statement read Customizing Error Pages and C# Programmers Reference: try-catch-finally. At this point you should be able to execute this application in your web browser and store an image and the other relevant information in the database and in this case the database is an Oracle instance. From here the next step is to create another web form which will display the stored images. Previously you were instructed how to store images and relevant data in your database. Now you will need a method to allow your users to view records and then the ability to view these images. The web form above has two controls, a DataGrid and a Label. The Label is used for display any errors that may arise. The following is the code for this web form. The next step will be to bind the data to the DataGrid. Once again take notice of the utility class that I previously spoke of. /// Summary description for Article570_1. The end result when this application is executed in your browser will look similar to the following screenshot. Now for the final step which will display the selected image. This is where the big payoff comes in. Once a user selects an image they wish to view you will need to accomplish the following steps. Create yet another web form only this time the only control you need to add is a Label and again the Label is used form displaying any errors that may arise otherwise we will display the image. Here is the code for the web form. 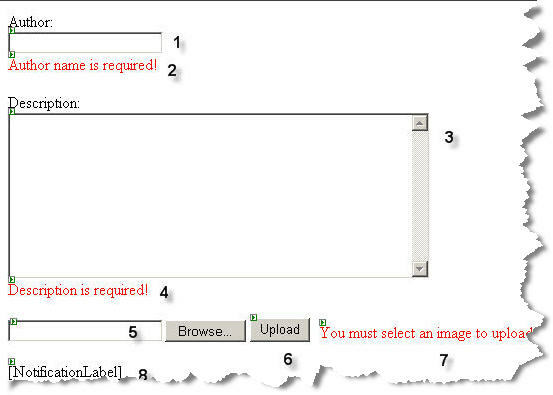 The requirement here is the photo id which is used to pull the correct record from the database and display the image using the BinaryWrite method. /// Summary description for Article570_2. At this point when you clicked view image on the previous webform you will have the image presented to your user via their browser. As this article now comes to a close, you should successfully be able to establish the database schema to handle a Blob, build the web form for the end user to utilize, and finally see the usefulness of the separation of common functionality whether you utilize a class or the Web.config file. Good luck and I would relish the idea of hearing any success stories born from this article so be sure to post you comments. Feel free to discuss this article at my Blog.